IF YOU BELIEVE IN AN afterlife, then one reason my friend Steve Territo died yesterday is to hold the good tables for the rest of us. And if you knew Steve, you know why that’s apt: I don’t have one memory of him where he’s not laughing, smiling or playfully conspiring. And few people I know, living or dead, are more qualified to slip the maitre d’ something for one with a view. But Steve is also the first of my friends to die P.F. — Post-Facebook — and in addition to saving our table he seems to be showing the way toward a new form, or manifestation, of mourning. Our tribe is scattered over most of Northern California and beyond; Steve married and moved to Tennessee a few years ago. Wherever he went, as good men do, he made solid friendships. Watching condolence messages begin to queue is like watching a holographic flower unfold: although we’re all in different rooms, it feels as though we’re all together, remembering and laughing and crying and just sitting in disbelief. And I hope it feels that way for everyone, at least a little bit. When people die, they leave a soul-shaped hole in the world. Touching the edges through my keyboard doesn’t make the loss any easier. Nothing does. But the electronic handholding helps; at least a little bit. Zecher tzaddik l’vracha — the remembrance of the righteous is a blessing. I just heard about Steve’s passing from Mom and James yesterday. 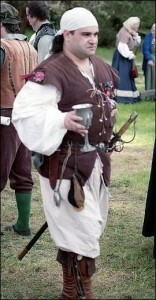 He was a beautiful soul and the best honorary “Big Brother” a girl could have at Ren Faire. This was a very eloquent post Neal. Thank you. Neal, Thank You for those lovely words. It gives me comfort knowing that Steve had such wonderful friends who thought so much of him. And it comforts us to know you made him so happy. Thank you. Thank you, Neal. What a lovely sentiment. It has been a poignant day, reading Steve’s Facebook page. Most of my contact with him lately has been through his blog and occasional comments on a mailing list we were both on. I wish I’d seen him, as happy as he was with Cathy in his life; I wish I’d been able to talk and share stories and a beer and feel his joy one more time.